Fantastically delicate and wholly moving, this is a gem to behold. Combining brilliant perfomances, trance-like direction and a minimal yet universal message, it is simply an experience that needs to be had. Some stories in Hollywood are told too often, almost to the point of parody. Some stories don’t get told nearly enough. There’s a wide and yet still growing gap between the stories that Hollywood choose to tell and the ones that get pushed to the side. Watching Moonlight come to fruition, sitting in that dark silent cinema screening and walking out as it finished, you come to realise that these are the stories, the characters that are often cast to the wayside for the next ‘YA franchise’ or the next ‘shared universe’. What a shame that is because what Barry Jenkins has created with his second feature is nothing other than astonishing. 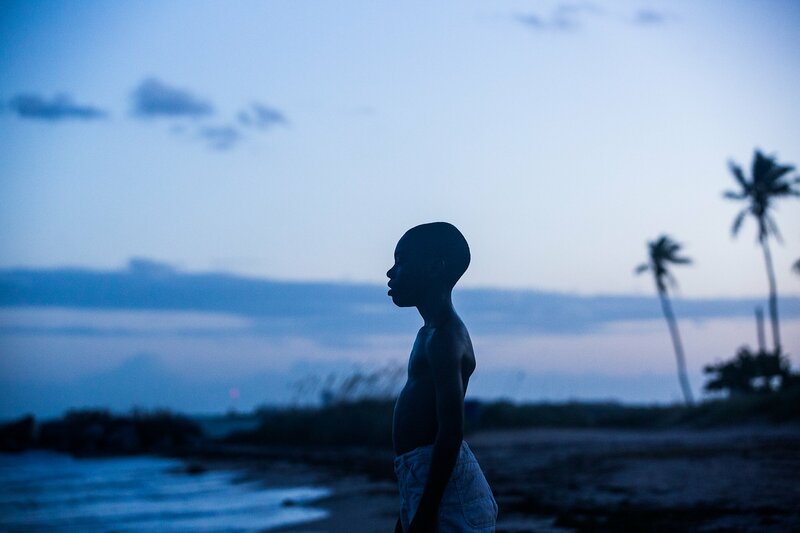 Moonlight, which was adapted from the semi-autobiographical In Moonlight Black Boys Look Blue, maps out the journey of Chiron from the age of 9 to adulthood. It shares that DNA with the likes of Linklater’s Boyhood however I believe that’s where the similarities end. Whilst Boyhood is very much a coming-of-age story, one in which the protagonist learns to grow and develop, Moonlight let’s us know that from the tender age of 9, Chiron has had to learn how to fend for himself pretty fast. There’s a telling moment very early on where he fills a bathtub with water that he boils on the hob and uses washing up liquid for soap and it’s obvious just from these few frames, how independent he has had to become. Barry Jenkins’ vision, both directing and adopting the writing role as well, is both grand and ambitious, yet intimate and personal. His dynamic camera work very rarely remains stationary for too long, allowing us to immerse ourselves in the world of Chiron, his environment. However, he never loses focus on the story he is trying to tell and in that sense, he is very deliberate in what he chooses to show us. When the camera does remain stationary, it’s almost exclusively shot in closeups and occasionally medium shots but never wide enough or more interested in what’s around the characters that we become distracted. Jenkins and his cinematographer James Laxton simultaneously (and successfully) manage to engage us in Chiron’s world and the world of the characters around him, but never loses us in it. Much like a compass, they guide you through the journey with a sure and knowing hand. As a visual piece alone, Moonlight is simply stunning. The choice of lighting, the way it illuminates the faces of the characters and Chiron’s surroundings is at times, hypnotising. Chiron becomes our eyes and ears in this world and absolutely, Jenkins captures that. From the dream-like, disorientating feel of his childhood years to the chaotic, crowded state of emotion in his teenage years, each segment has it’s own visual style and feel and is all the better for it. The pertinent and persistent question that permeates throughout Chiron’s journey is one that isn’t exactly unique but is done in a way that gets to the heart of the issue. Who you are; or rather, as the film repeatedly reminds us, ‘who you is?’. The idea of your surroundings, the people you are exposed to and the life that you choose to live is what defines you, is expertly dissected by Jenkins. The three act segmentation of the story does little to alienate us from the story but in fact, it drives this point further home. The opening segment which is dominated by Mahershala Ali’s Juan, a cuban drug dealer, introduces the conflict between Chiron and the outside world. The young, doe-eyed, frightened boy that Juan takes a liking to is very much similar to the one we end with, complete with the same raging confusion inside him about his own character, about who he is. The film is populated by characters that shape Chiron and thus, become the crux of the story itself. The danger, however, when Jenkins took on this story, is that those very characters have become clichéd caricatures of the real-life people they mirror. Thankfully, Jenkins and the cast that he has put together, take these clichés and turn them into real, three-dimensional characters. From the drug-dealer, the junkie mum, the high-school bully and the confused teenager, none of these characters feel generic or lazy. Mahershala Ali’s presence is fantastically weighted and charismatic, making the moral dilemma of what kind example is he setting for Chiron one that challenges us. Naomie Harris’ performance as Chiron’s drug addled mother is both devastating and heartbreaking. Harris was reluctant to take on the role, due to it’s negative portrayal of black women. However, the nuance that she brings to the role, breaks that mould superbly. The decision to have Chiron portrayed by three different actors could’ve proven to be a stumbling block for Jenkins but miraculously, all three performances are note-perfect. Alex R. Hibbert as ‘Little’ fantastically captures the essence of innocence lost as a scared, lost little boy. Ashton Sanders makes you believe in his struggle as a teenager, battling with his internal struggle both with his sexuality and the type of person he wants to be. Trevante Rhodes as this hulking mass is at first, a shock to behold. A far cry from the gangly teenager we left him as, but still maintains that confusion and internal strife that has plagued him. The cast is rounded off with André Holland who is simply brilliant as a long lost companion of Chiron’s and a beautifully warm perfomance by Janelle Monáe as a somewhat more conventional mother figure to Chiron. Moonlight is a film that comes at an important time. At a time where black lives are underrepresented in nearly all facets of life, it provides a delicate and nuanced look into lives which do not nearly get the exposure that they should. It’s a story that transcends the trappings of cinema and touches the soul of what it means to be you, regardless of creed, colour or sexuality. Moonlight (2017), directed by Barry Jenkins, is distributed in the UK by Altitude. Certificate 15.